Hope each one of you is enjoying a good weekend. We have great summer weather here; and I am looking forward to fresh tomatoes from my garden soon. Already have a few zucchini, and am waiting for more. Peppers aren't doing too well. Sigh. Do any of you have photos that you would like to share, ones that I could use in the Pantry? If so, let me know! Leave me a note in the comments perhaps. I do have more New York photos I could share, but I am hoping someone else will send me some. Susan has chosen the prompt 'Acceptance' for this Wednesday's Midweek Motif. Her surgery is behind her now, and hopefully she is well on the road to recovery. Thanks to all of you who continue to support Midweek Motif!! And on Friday you will be 'blown away' by Rosemary's new feature! It has a catchy title that will immediately capture your attention. I took a sneak peak & was really excited about what I found. We are so lucky to have such a poetry scholar on staff. I hope each of you will visit and support her in her Friday features. We all like a bit of support for our efforts! If you have Facebook, do think about following Poets United on Facebook. That way you are informed of each new feature. With no further delay, hope that you will enjoy the Pantry today. We always enjoy it if you leave a short comment when you post. Think about it as having a cup of coffee with friends before beginning the work of the day! Do be sure to visit the links of others as well. It is sort of like knocking on the doors of others, I think. When we leave a comment, we let someone know that we enjoy them in the 'neighborhood.' And the blogosphere IS a neighborhood, isn't it? It's officially summer in Japan and my post is about the festival that signals the start of summer. 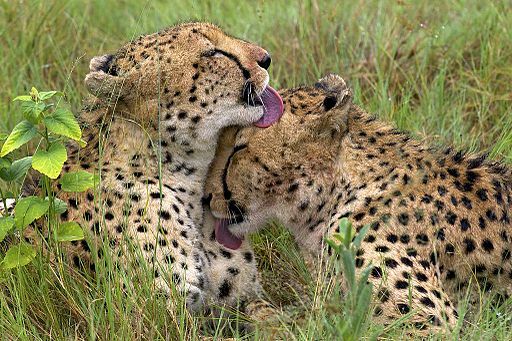 the cheetahs looks so very loving - a topic I touched on this week. Enjoying uniting with other poets out there and thankful for the feedback too - if only wordpress and blogger made it easier to unite! It’s been a while since I was last here. Today’s offering from me is my latest poem to be published, uploaded to the site this week. I have been a bit quiet recently, stricken with eye problems – caused by too many hours on the computer – Doh! But all sorted now… And it’s so lovely to be back here again and really looking forward to catching up with lots of fresh new poetry from you all…. Hope your eye problems are behind you, Scott. Hello, and thanks for the thoughts. Have a good week! I love gardening and wish I could be there to see your fresh tomatoes and zucchini Mary.. hope you're well and thanks for updating us about Susan. We miss her! Another beautiful Sunday morning! My favorite time of day is morning really...with the whole day ahead to enjoy. Part of it I will enjoy with you. What a perfect day to sit, drink a cup of coffee and savor the wonderful words of poets....I look forward to it! Have a fabulous day everyone! Always a treat to enjoy verse and friendship on a fresh Sunday morning. Warm rays of hopefulness to each of you. And Susan we are glad to hear that surgery is in your past. Good morning everyone. I am getting ready to go off teaching for a couple of weeks. It is always both a busy and fun time for me. Susan, I am glad that your surgery is behind you an am wishing you a speedy recovery. I will take my camera with me to Walker Creek Ranch and see if I can get some good animal shots out there in the hinterlands Mary--Happy Sunday all! Yes, please get me some photos, Audrey!! Smiles. We have zuccini and will have tomatoes. But nothing else is doing very well. I feel sad for my husband who put so much effort into his garden. Thanks again Mary for hosting. I keep wanting to take pictures to share with you, then the week goes along and I forget. So sorry. I'll do better soon. Have a great week! I do love fresh zucchini and tomatoes. Hope things improve in your husband's garden as summer continues. Huffing and puffing. I just got in from babysitting all weekend at my friend's place. It is 1:30 p.m. here and I see I am already far behind. I will link soon and then start making my way thru the Pantry. Happy Sunday to all and wishing you a speedy recovery, Susan! Love the cheetah shot. In time to post my poem this week. Recovering from a horrible cold, which has been prolonged by the most unseasonal weather here in the UK for summer. Very close to using central heating in July, with the wind and endless rain. Sorry about your weather, Eileen. Seems that in so many places the weather is unseasonable in one way or another. Love the leopards, Mary! Thanks for the heads-up about the new feature. Busy day here, butI hope to get around to reading others before too long. LIFE OF A POET ~ VINAY LEO R.